It’s getting towards the end of the cherry season so if you’ve not feasted on these quintessential summer fruits, crack on. They are delicate fruits which makes them hard for the supermarkets to deal with which in turn makes them very expensive. 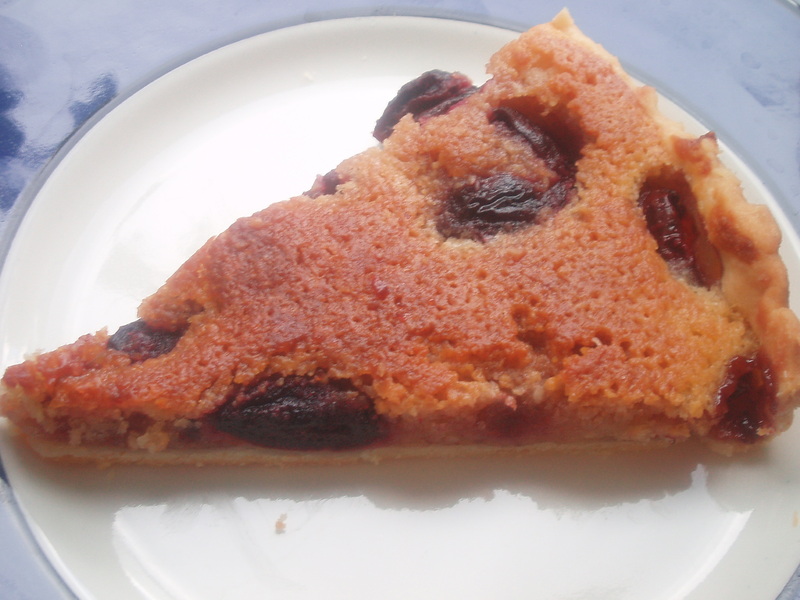 But this is where markets come into their own – so get yourself down to Leicester market where they are currently much cheaper, buy up a kilo or two and use some for this gorgeous cherry frangipane tart. You could make individual ones but I made one large one in a 10 inch loose bottomed tin. You’ll need: cherries, butter, ground almonds, caster sugar, plain flour, eggs, shortcrust pastry, jam. Take around 8oz of cherries, stone them and poach them for just a couple of minutes with 2oz caster sugar and 2 tbps of water. If you’ve got a bottle of kirsch hiding at the back of the cupboard you could put a little of this in too. Cool and drain, but retain the juice in the pan which you can later simmer until reduced to a syrup – use this to glaze the finished pastry. For the frangipane, cream together 6oz of caster sugar and 6oz of butter. Then mix 4 oz ground almonds and 1 oz of plain flour. Add an egg to the butter and sugar and fold in some of the almonds – when it’s all mixed in, repeat the process with a second and third second egg and the rest of the almonds. That’s your frangipane done. Roll out 8oz short crust pastry and use it to line a tart case. Spread some jam thinly – cherry ideally but any red fruit will do, I used damson. Then add the cherries, and then the frangipane, using a light touch to spread it evenly over the pastry and the fruit. Bake it for around 30 minutes at gas4/180C, and then glaze with the syrup. Serve warm or cold with cream. Enjoyed a splendid winetasting at Carluccio’s in Leicester’s Highcross last night. Of all the chains I’ve been to, this lot seem to pull it off best – the environment is classy, the staff seem to care and while I know the menus are run with strict corporate rigour, the food still manages to convince. This event was part of their summer promotion of wines from Veneto and featured five wines introduced by Mike Stocks, the company’s bar training manager. I’d say four were very good indeed – a fruity Prosecco Santo Stefano and three more from the Bertani company, which has a portfolio of 200 hectares around Verona. These included an elegant rose and a stylish Soave which was apparently served at the coronation of George VI. Best of all was the superb Amarone Villa Arvedi – a prestige wine obviously, but despite being a stonking 15 per cent, it was smooth, well-balanced and not overpowering. The wines are not cheap – the Amarone is £30 – but given that you can buy them in the deli part of the restaurant and drink with your meal for £5 corkage, they start to look rather good value. We enjoyed some excellent anti-pasti with the drinks – very light squares of polenta with melted gorgonzola, roasted marinated vegetables, super fishcakes and parma ham on grilled bread. At £10 this was an excellent little promotion for the “Magic Hour” of 6-7pm, and it’s worth looking out for future events – Carluccio’s Leicester. Sometimes you just to want to eat cheap. Sometimes you want to push the boat out. Sometimes you want to push the boat out and feel swanky because your finger is right on the pulse of the restaurant world. Doing the latter is not always easy in Leicester. So, on Saturday we all got on the train and went to London. Destination was Pollen Street Social, Jason Atherton’s post-Gordon Ramsey break for freedom. It opened a couple of months back to very positive reviews – “properly brilliant” said John Lanchester in the Guradian, and it got five out of five from Time Out for “a master chef at the height of his powers”. The “Social” tag indicates that while this is about high end cooking in the style Atherton developed at Maze, it’s not a trad fine dining environment but a relaxed, dress-code free place that encourages fun and conversation. It’s informal but there’s plenty of staff to look after you – service from the very young team throughout the night was friendly and in the main polished despite a few dribbles on the wine and some awkward pacing when it came to serving drinks and our starters. 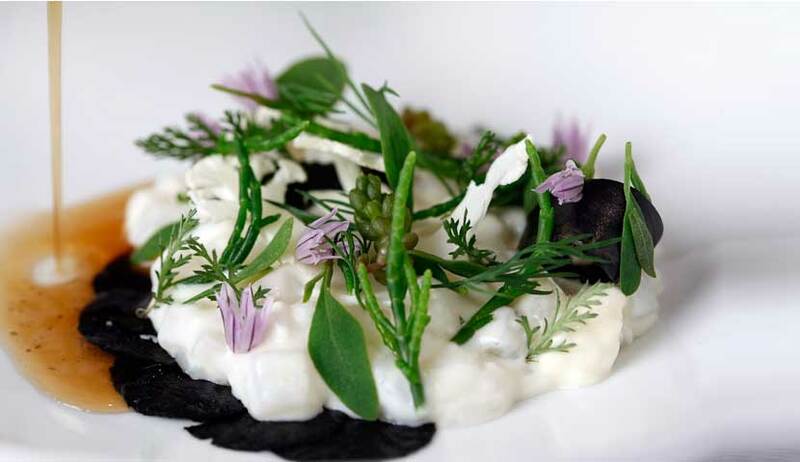 Starters were small but beautifully formed and it was evident from the beginning that there was a lot of both artistry and hard labour going on among the massed ranks in the kitchen – visible to diners through a glass wall. My squid and cauliflower involved the veg being sliced to feathery thinness and fish being diced to form a faux-risotto – very nice and very pretty with the flavour in the main coming from a remarkable clear consomme poured over and made from roasted squid. Giles Coren writing in The T*mes described it the squid juice as of “El Bulli-ish inventiveness”. I can’t really comment, but it was very powerful. “Full English Breakfast” was a bit of a forced conceit – one rather delicious egg melting over tomatoes, a couple of tiny hammy bits and fried bread croutons – some nicely-crafted flavours but crammed into a couple of mouthfuls it left my pal feeling a bit short-changed. My halibut main course was a perfectly good piece of fish but was surpassed by a fantastic “catalan paella” of astonishing intensity – seafood mainly, but I think some smoky sausage in there too. Little additions such as a scrap of wafer thin pork fat added a huge amount too. Roasted Dingley Dell pork came as belly and cheek sitting on a pine nut paste with toasted oats, black sesame seeds and crushed juniper berries and served with roasted hops and beer sauce. Opinion varied between very good indeed and “not bad – had better”. (Go here for a little film on youtube of Atherton making this dish and introducing his restaurant). Deserts were of the broken down and distributed over the plate variety – “PBJ” was a sophisticated take on peanut butter and jelly, with parfait, cherry jam and creamed rice puffs, while strawberry and vanilla cheesecake with a strawberry sorbet and nut crumble was also strewn around the plate like the aftermath of a bomb. All the bits I tasted were gorgeous though neither I think totally blew away their orderers away. My lemon meringue was slightly more conventional in presentation and was exceptionally clean and fresh-tasting with lime and cream cheese sorbet. Rice pudding was deemed rather ordinary while the accompanying hay ice-cream divided opinion with its strong farmyardy flavour. It’s a really nicely done out space and packed full on a Saturday it had a great buzz about it. The food is creative and full of great touches – duck fat chips were great, the wines fantastic – but I don’t think any of us felt real knockout punches had been landed. Worth the trip to London? I’d say so. Would I try somewhere else next time I had £80 to spare on a blow out meal and drinks? Yeah, I think so.